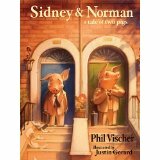 Sidney and Norman by Phil Vischer; illustrations by Justin Gerard. The Frog and Toad series (along with the Little Bear books by Else Holme Minarik) helped change the style of beginning books for children to read for themselves. First published in 1970, Frog and Toad Are Friends was an instant hit. The two friends are as opposite as Sidney and Norman (see above) and they don’t always get along. They disagree, they hop off in disgust, they do and say embarrassing and wrong things; but at the end of the day, they are still best friends. 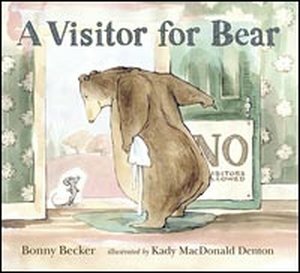 Each story is an understated golden lesson in friendship that children everyone need(s) to hear. They need to hear that it isn’t always easy to be a friend, that sometimes we mess up, and that we need to be kind. And that we all need forgiveness and we all need to forgive. The frog and the toad couldn’t be more human. 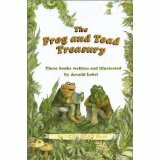 Ages 3-7 to be read to; Ages 5-8 for reading alone Buy the Treasury — it includes Frog and Toad Are Friends, Frog and Toad Together, and Frog and Toad All Year. (There is one more that is missing in this trilogy — Days with Frog and Toad, published in 1979.) These are technically Beginning Readers, so your first grader will be able to read it, but for goodness sake, sit down and read it with them. You don’t want to miss these great stories and wonderful discussion starters. (Note: The James Marshall books about the hippo friends George and Martha were originally on this list as well. But as I read and reread the list, I just felt that these two “Old Classics” shouldn’t both be on the list. 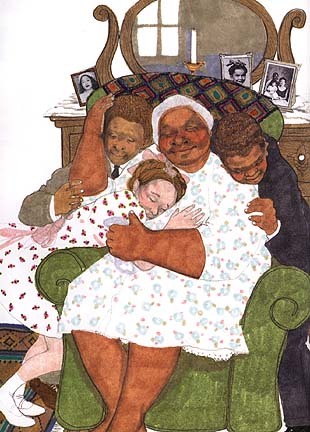 So if you love Frog and Toad, make sure you check out the George and Martha series too. 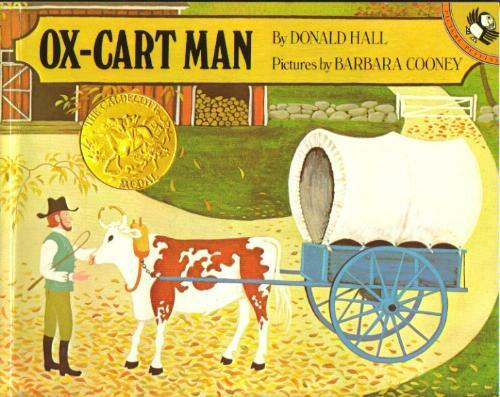 Ox-cart Man by Donald Hall; illustrations by Barbara Cooney. 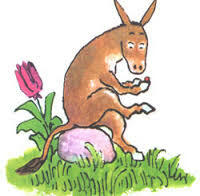 Barbara Cooney’s delicate primitive style illustrations are part of why Ox-cart Man made this list. 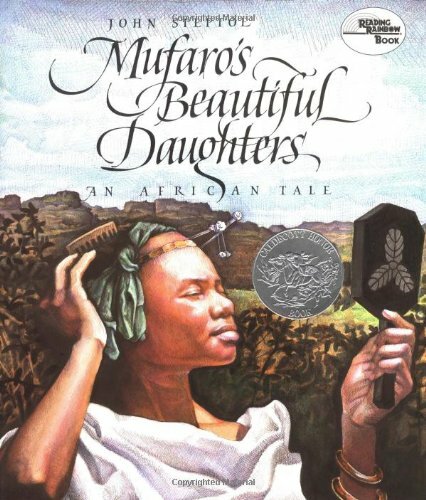 It was a tough call between this book and Cooney’s own Miss Rumphius. But ultimately I think I chose this one because I love what it represents. 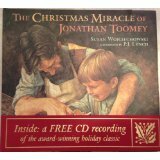 On a long-ago New England farm, the family spends the year making what they need and being self-sufficient. Then in late fall, the father packs all the extras that they have made and grown that year into his ox-cart and walks many miles to the town of Portsmouth where he sells it all. Even the cart. Even the ox. With the money he makes, he buys what supplies they will need and small gifts that will please his wife and children. 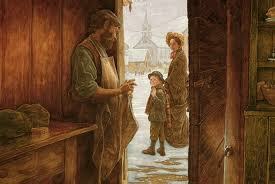 Then he walks back home, and the seasons of making begin again. The Ant and the Elephant by Bill Peet. 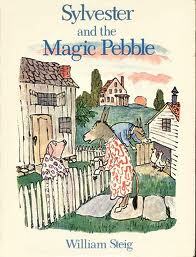 Bill Peet has such an amazing body of work that it was difficult for me to choose my favorite. My children and I loved Farewell to Shady Glade (an ecological tale told from the animal’s point of view) and No Such Things (a hilarious book filled with crazy, made-up animals). But The Ant and the Elephant is the classic story of the large and the small, with the ant saving the life of the elephant. Kids love it! This book is filled with other gentle lessons as well. The elephant goes through his day fixing the lives of other animals who have gotten in trouble. None of them are grateful; in fact, this book might be filled with some of the orneriest critters ever drawn. But by the end of the day, the elephant is feeling pretty smug and self-satisfied for helping everyone — and sure enough — then he gets into trouble! Ant comes to the rescue, and all ends well. Last Stop on Market Street by Matt De La Pena; pictures by Christian Robinson. I lied in one of the earlier posts. The Red Thread, an adoption fairy tale by Grace Lin. How about you? 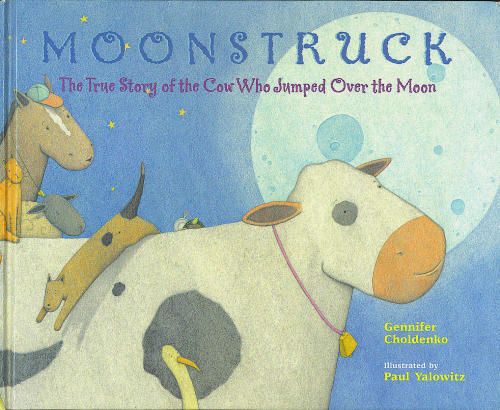 Do you have a favorite picture book of all time? Or twenty-nine? 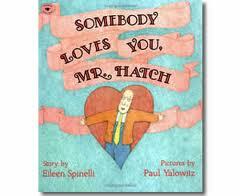 Somebody Loves You, Mr. Hatch by Eileen Spinelli; illustrations by Paul Yalowitz. Eileen Spinelli’s book is the absolute best Valentine’s Day book ever, but really any day is a good day to read this book to someone you love. Mr. Hatch is quiet and keeps to himself. He has an uneventful life and talks to no one, and no one talks to him either. 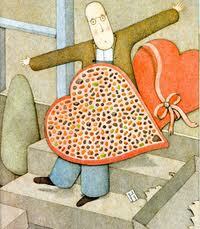 Then one day the postman brings him a box of candy with a note that says it is from a secret admirer. Mr. Hatch is stunned. He has a secret admirer? And suddenly he finds a silly little grin on his face. He puts on a yellow tie and some aftershave. He brings the box of candy into work and shares it with his co-workers. In short, his life is changed. All because someone loves him. I Wish I Were a Butterfly by James Howe; Illustrations by Ed Young. 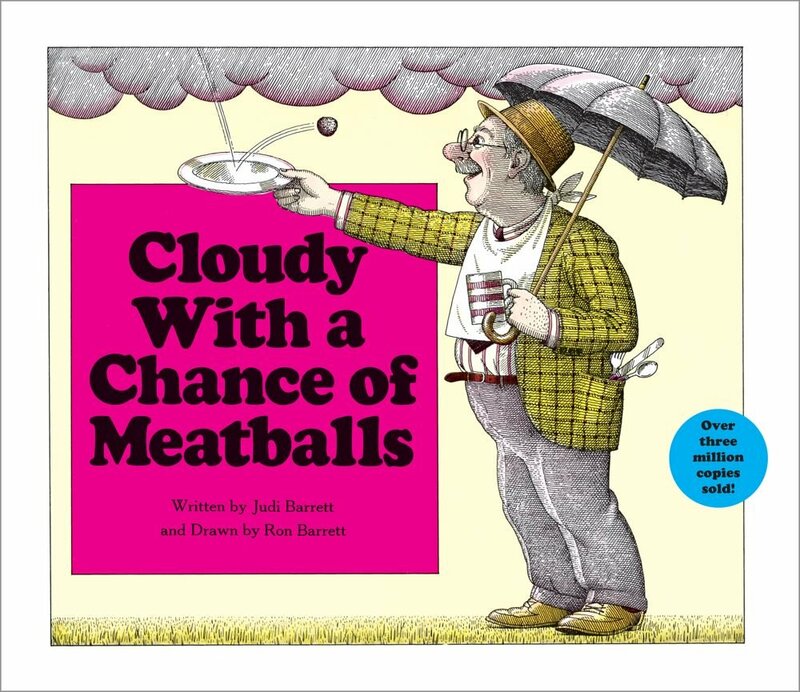 James Howe is famous for writing the Bunnicula series; Ed Young is famous for his elegant watercolors. (His book Lon Po Po : a Red Riding-Hood Story from China won the Caldecott Award in 1990 for the best illustrated children’s book of that year.) 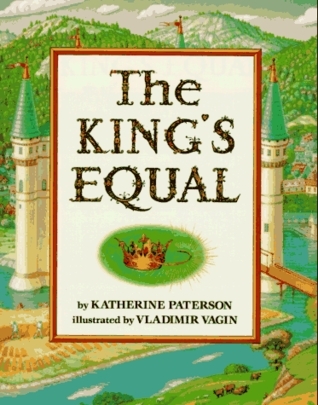 But together, they have made a superior storybook. This is a bit long — probably best suited to a six-to-eight-year-old’s attention span. But the main idea is timeless — we are all beautiful, no matter what our outside appearance is. 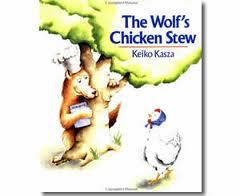 The Wolf’s Chicken Stew by Keiko Kasza. 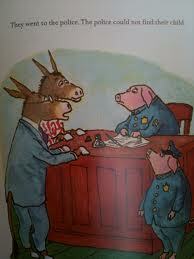 Simple illustrations, simple story = belly laughs and a great moral. Enemy Pie by Derek Munson; illustrated by Tara Calahan King. And if you would like specifics on how to love your enemy, here is one of the best instruction books — Make Enemy Pie. 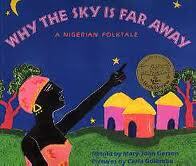 Why the Sky Is Far Away: a Nigerian folktale by Mary Jane Gerson; illustrated by Carla Golembe. Once the people lived in paradise — all their needs of food came from the sky. But they grew greedy and wanted more, even though the God of the sky had warned them about their greed and lack of obedience. One woman’s selfish greed ruined it for all the people, and as their punishment, their God moved away from them and the people now had to toil for their food. Sound familiar? The Fantastic Flying Books of Mr. Morris Lessmore by William Joyce; illustrated by William Joyce and Joe Bluhm. This is the perfect book. 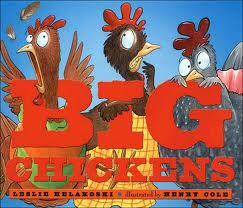 Big Chickens by Leslie Helakoski; illustrated by Henry Cole.